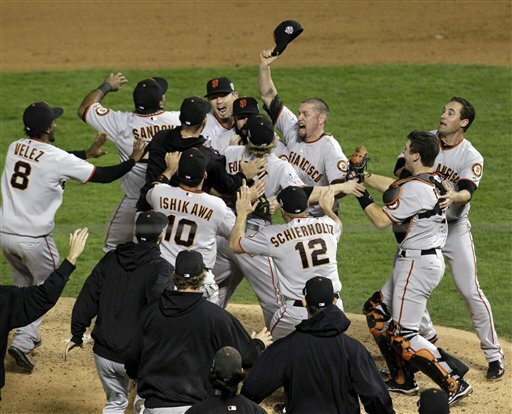 For the last couple of years, I’ve had a picture of the Giants celebrating the final out of the 2010 World Series as the wallpaper on my computer. Last fall, I added an image of the Giants celebrating the final out of the 2012 World Series, rotating the two images in a slideshow. As I was recently looking at that 2010 image, it struck me how few of the players on that team are still with the Giants. Consider this: Of the nine players who were on the field for the final out in Arlington in 2010, only one player was on the field for the final out in Detroit in 2012 — Buster Posey. Even more intriguing is that of Dec. 12, 2012, only one of those nine players on the field in 2010 were still with the Giants. Andres Torres re-signed with the Giants on Dec. 13 after spending one season with the Mets. And still more intriguing still, only four of those players on the field in 2010 are currently employed by a major league franchise. It really goes to show what a band of misfits those 2010 Giants were. Of the 25 players on the active roster for the 2010 World Series, only nine remained with the Giants for 2011, 2012 and into the 2013 preseason. And as pitching has always been the core of the Giants’ success, it should come as no surprise that seven of the nine players were pitchers: Tim Lincecum, Matt Cain, Madison Bumgarner, Sergio Romo, Santiago Casilla, Jeremy Affeldt and Javier Lopez. The other two are Posey and Pablo Sandoval. Barry Zito was left off the 2010 postseason roster, but he’s still with the Giants. Traded to Royals after 2011 season; traded to Rockies in July 2012; signed minor-league deal with Pirates, trying to land job. He had 11.81 ERA this spring with 8 walks in 5.1 IP coming into Friday. He had a solid outing Friday vs. the Astros, so there’s some hope. Traded to Mets after 2011 season. Granted free agency and re-signed with the Giants. Trying to earn roster spot in spring training; likely won’t. Underwent second Tommy John surgery April 2012; missed most of 2012 season; non-tendered in December; still free agent; last seen wandering mall in ketchup-stained T-shirt. Signed as free agent with Brewers for 2012 season; signed as free agent with Orioles in December 2012. Released by Giants at end of spring training in 2012; signed with Phillies; released by Phillies in August 2012; signed minor-league deal with Rays with invite to spring training. Claimed off waivers by Yankees in November 2012, then claimed off waivers by Blue Jays, and then by the Rangers. In spring training camp for Rangers. After struggling through 2011 with Giants, signed as free agent with Red Sox in 2012; after solid 2012 season, signed as free agent with Diamondbacks. Struggled with injuries in 2011 with Giants; retired after 2011 season. Who is this Johnny Monell and where does he fit in San Francisco Giants catching depth chart?